As long as I’m blogging about mobile technology, here’s a snapshot of what’s selling in the iPhone app store after five months. I’ve downloaded a number of apps, paid for just a couple, and almost never use any of them. I use the phone for voice, texting, email, and to a lesser extent, Twitter. Every once in awhile I play dice poker if I’m bored. Patrick Mueller has written a pretty good developer-centric overview of where Android stands today. I’m eager to see Android make it onto more handsets, and for the UI to pick up more polish. I find that over time, user interface polish takes on more and more importance for me, and the iPhone’s nicer interface insures that I’ll be sticking with it until Google makes some pretty major improvements to Android, and until they find a hardware partner who designs devices as well as Apple does. We can assume the calculation is similar when selling things other than political candidates as well. Louis Menand has written an article damning texting as the nadir of human communication. As a late but fervent adopter of texting, I’ll argue to the contrary. One of the biggest complaints about texting is that entering text using the numeric keypad on a mobile phone is incredibly tedious and painful. On this note, I agree. I never texted until I bought an iPhone. Here’s the thing — cell phones that provide only a numeric keypad are an endangered species. Blackberry and iPhone are the harbingers of the future in this regard. With a real keyboard, texting really isn’t too painful, and there’s less incentive to abbreviate everything. Usually, if you can text a person you can much more quickly and efficiently call that person. If you’re sitting in a meeting, or eating at a restaurant, or even standing in line at the post office, talking on your phone is impossible at worst or rude at best. I can text anyone with the knowledge that doing so will not interrupt whatever more important business they’re taking care of. If they have time, they can look down at their phone and read the text immediately. If they’re busy, or even in the middle of an interesting conversation, they can save looking at the text for later. Yesterday I was in a meeting and couldn’t pick up a call. I was able to text the person who left the voice mail immediately and ask them if the call was urgent. Brevity is a huge advantage in a certain kind of relationship. The 140 character limit can certainly be a relief to text someone when you’re short on time and you know more would be expected of you if you contacted the person via email or called them. The tedium of entering text and the forced limit on size demands that texts get down to business. I know many people who prefer to text for this reason alone. And finally, immediacy is what separates texting from email. Most people (other than Blackberry users) don’t get email on their mobile phone as soon as it’s sent. So if you need a response right away and the recipient is available to provide it, text messaging works like a charm. People should learn to love text messaging, because it’s with us to stay. There’s no other form of communication that offers exactly the same set of strengths, and I expect it to grow as more people outside the texting generation recognize that. Given Apple’s developer-hostile practices when it comes to the iPhone and the iTunes App Store, it’s becoming increasingly important for other mobile phone providers to build handsets that are more competitive with the iPhone. It looks like the best hope on that front is Google’s Android, so I was interested to read Tom Conrad’s thoughts on the platform. Conrad is the head tech guy for Pandora, the Internet radio company whose client is one of the most compelling iPhone applications. He lists as plusses Google and the Android team, and as minuses, the fact that differences in hardware will make things rough for developers, and that carriers (not Google) will be the ultimate arbiters of how open the platform is. I think many people who aren’t iPhone owners might see it as odd that people feel so strongly that Apple needs competition in the handset market. The iPhone is a relatively small player in terms of market share. The thing is, though, I don’t think there are many iPhone owners who would trade their phone for any other handset on the market. Blackberry is nice in some ways, but it’s not an iPhone. (Nor is iPhone a Blackberry.) The market is crying out for more decent substitutes for both. It’s an acknowledgement that entering text using a virtual keyboard isn’t foolproof, and it provides a good compromise between masking passwords so people can’t see your password over your shoulder and enabling users to avoid typos when entering them. By the way, this screen shot was taken using the new screen capture feature in iPhone 2.0. Update: Commenters have noted that other phone makers have been doing it this way for years. 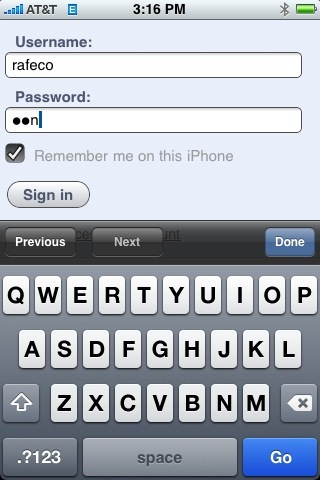 I guess what this really means is that the iPhone is the first phone that I’ve ever used to enter a password. Will Blackberry users like the iPhone? John Gruber digs into opinion among Blackberry users on the iPhone’s virtual keyboard. My theory on the iPhone has been that people switching from non-smart phones will love it, and that people who are switching from other smart phones probably won’t like it. If you are already a heavy Blackberry user, the loss of productivity switching brings on probably doesn’t compensate for the areas where the iPhone is superior to the Blackberry. I didn’t have a huge amount of evidence to support that theory, just my own preconceived notions and the case of my Blackberry-dependent friend who tried to switch to the iPhone and wound up returning it and getting a newer Blackberry instead. It’ll be interesting to see if the upcoming features for the iPhone make it worth it for Blackberry users to ditch their mad Blackberry skills and start over.